Design with intelligence. That is the first principle of our design process. As important as aesthetic character may be, if a house is not designed with intelligence, with a proper understanding of how a house will function and age, it can lead to headache upon headache for the owner. 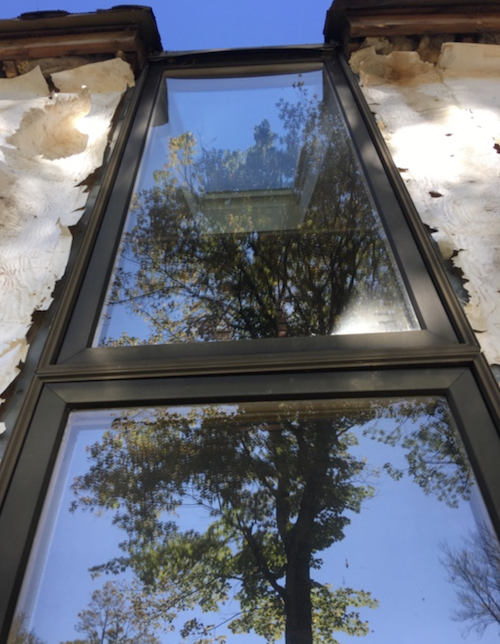 We have recently taken on a residing and replacement window job on a stylish house that is thoughtfully sited on a beautiful lakeside lot. I like the aesthetics of the house. It is well proportioned and looks solid and well built. But pulling the siding off has revealed a consequential flaw in the design. The house features some innovative roof glazing units that were cutting edge in their day. They allowed for nearly continuous glazing, running from the roof and continuing down the exterior wall. The visual effect is striking and novel, the effect on durability far less so. What is clear from the damage that has developed over time is that the house was designed and built with very little understanding or regard for the water management problems that this unique design would create. Bulk water poured off the roof slopes and flooded the side of the house, overwhelming any efforts at protecting the house. The result was massive amounts of rot inside the wall cavities. 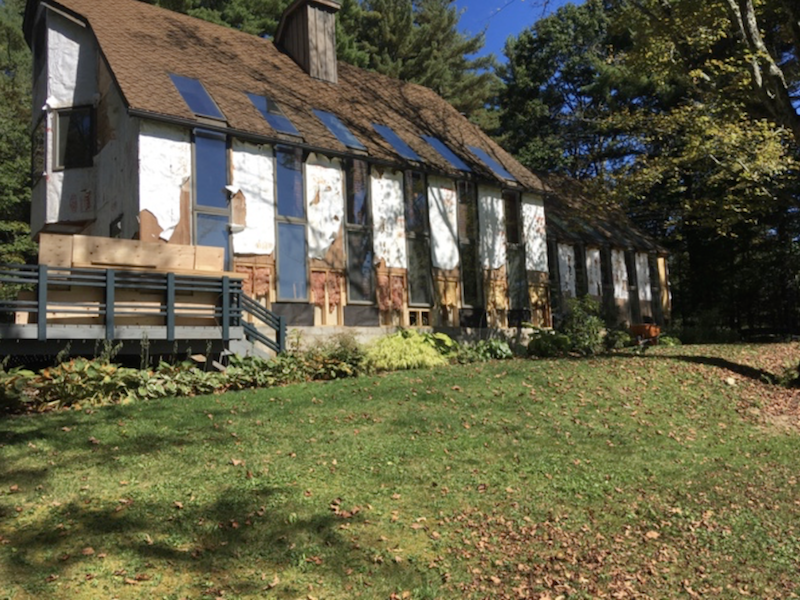 Though aesthetically appealing, the combined roof and wall glazings sold by Pella Windows in the 70’s and 80’s, at least as installed on this house, created a perfect storm for rot creation. Without the usual roof overhangs directing water away from side walls, bulk water flowed freely over the edge of the roof glazing units and down the wall units. Even if the windows had been installed and flashed perfectly, I’m not convinced the design would have worked. But the installation and flashing was not done well, sealing the structures fate. 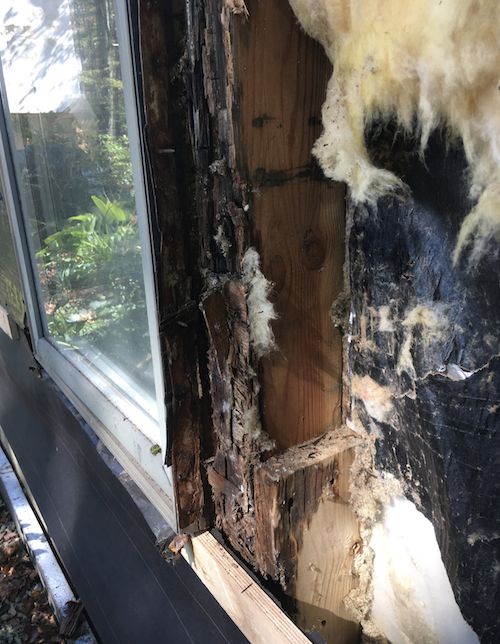 During installation, some effort was made at caulking behind the window flanges, but no effort was made to seal the house wrap to the flange to create a continuous weather resistive barrier around the house. Water, a lot of water, easily got behind the window flanges and badly rotted the rough openings.